Save Time, Efforts and Money With Our Furniture Assembly Services! Shopping for ready-to-assemble furniture often times takes more time than you thought. Next comes transporting the flat pack furniture to your home. It is often times a tedious and pricey process. And at the end comes the actual assemblage. It is an interesting moment the first time you do it, but afterwards it’s a frustration you want to deal with as soon as possible. Or get someone else to do it. Office Furniture – If you are furnishing a new office or changing some of the old furniture, we provide professional and fast flat pack assembly. Dining Furniture and Kitchen Units – It would surely give you some piece of mind to know those cupboards and counter-tops are assembled and installed by certified specialists. And your newly bought dining chairs and tables will be put together so good, they will serve you for decades. Patio and Garden Furniture – Outdoor lounge-ware provides extra comfort on sunny days. We'll make sure yours stand the test of time! Bedroom Furniture – Beds and nightstands, wardrobes and closets – we can handle it all. Your domestic comfort is 100% guaranteed! Children Furniture – We even assemble bunk beds, small-size desks and swing sets in a safe manner for your kids to enjoy. There might come a time when you decide disassemble some of your furniture to free up some space or replace it with new furniture. Or you want to transport all your furniture to your new home or office. If that's the case, then we'll be of great help to you as we offer furniture disassembly service in London. And when the time comes, we can reassemble them back into the same sturdy condition they've been. Convenience at it's best! When it comes to assembly services of IKEA furniture, we have years of experience in putting together any of their furniture types! Not only that but we can help you with purchasing and transporting the furniture to your property. This service is incredibly popular among busy homeowners and commercial clients. For more details, visit the Collection and Delivery service page and find out how to set up a collection-and-delivery service. 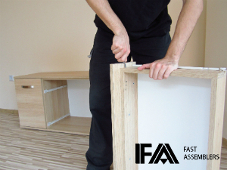 Contact Fast Assemblers And Take Advantage Of Our High-End Flat Pack Assembly Services! Flat pack furniture collection, delivery and assembly in London has never been easier. You can visit our FAQ page for more details or just give us a call on our 24-hour customer care hotline and talk to one of our friendly consultants. They will provide you with any information you might request and even offer you a free price estimate for your service. Simply call us at 020 3746 1134. Keep in mind you can schedule a service online as well – all you have to do is fill in our simple booking form.